The author of this post, Margaret Jean Westby, mounted her project Orbital Resonance in the CEREV Exhibition Lab on October 17 as a component of her PhD in Humanities through Concordia’s Centre for Interdisciplinary Studies in Society and Culture. My research encompasses both theoretical and practical approaches towards exploring strategies to re-map gender imbalances, behaviors, and engagement in the area of technologically augmented dance performance. My principle research question is: how in art and technology projects do interdisciplinary considerations and frameworks for collaboration shape our understanding of gendered bodies and technical interactions? In theory, this involves the creation of an unconventional genealogy of key historical and contemporary female artists that hybridize human and non-human phenomena in their works. In practice, Orbital Resonance is one intervention aimed at answering my research question. Orbital Resonance is a research-creation project that explores what it means for different genders from multiple disciplines to come together (two men and two women) to collaborate artistically in the field of technologically augmented dance performance. The work was an exploration into internal physiological states of the body, outwardly displaced in light and sound to create an immersive sensory environment. The performers improvised with sound and movement through breath, voice, and body-based sensors. I have witnessed first-hand a dancer’s naiveté concerning technological devices as well as the gender divides in technological domains. I have been involved in dance from a young age and have been engaged with technology in corporate environments in my employment history and in various art projects shown throughout this exhibit. My artistic practice emphasizes collaborations, whether in creating performances or more traditional films. 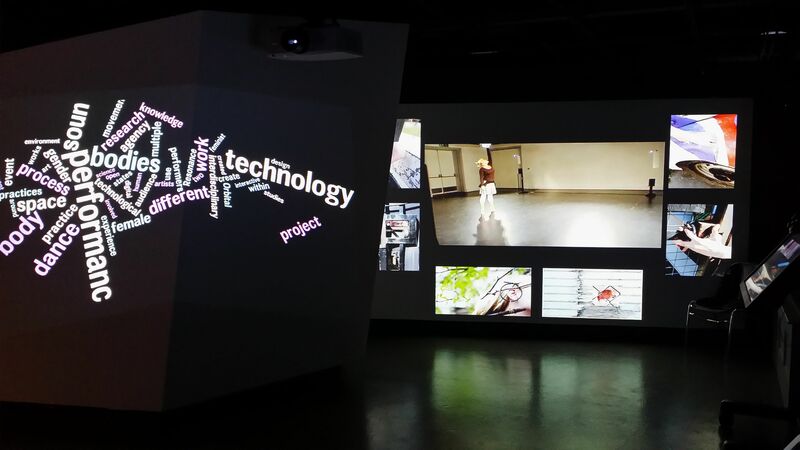 At the CEREV lab, I was able to exhibit my work through the use of multiple screens and presentation of artifacts from the process of creation to documentation of the final performance event. The Director of Technology, Lex Milton, was extremely supportive and vital to preparing and planning my multimedia artistic works to display sonically and visually representations in support of my research-creation component of my PhD dissertation work. Through this exhibit, I was able to showcase my artistic work of Ricochet, multiple films, and a touch-screen online display of Orbital Resonance to discuss the importance of research-creation work within the academic institution amongst my committee of Dr. Christopher Salter, Dr. Krista Lynes, and Dr. Mark Sussman. My interdisciplinary aims of combining feminist Science and Technology Studies, performance studies, and anthropological and ethnographic influences as a situated practitioner merging these fields were all discussed within this framework in an artistic exhibition. An effort to maintain an interdisciplinary, horizontal collaborative approach at all times is vital to my artistic practice. In defining interdisciplinary, there are several levels involved. In the case of Orbital Resonance, there were both institutional factors (the university, the graduate programs, and the affiliated research labs) and individual motivations to consider. In an exploration about how to theorize and define interdisciplinary, Georgina Born and Andrew Barry address the multiple issues and complexities involved with addressing interdisciplinary research. They stress the importance of addressing interdisciplinary, not as a “historical given”, but as “mobilising in any instance an array of programmatic statements, policy interventions, institutional forms, theoretical statements, instruments, materials and research practices” (2013, p.10). In most cases of technologically augmented dance performances (or even most dance performance events), a clear divide of stereotypical gender roles is enacted. Our performance event invoked different ways of approaching the typical set-up of a performance event, the different agencies in action, and the development of play within the environment for both performers and audience members. This research-creation project was a platform to explore what the implications are for different genders and different academic disciplines of thought to join together to create new understandings about the creation process and in a performance event. The implications of the rapid advancement and infiltration of digital technology in everyday life are still unknown. But when performance arts interact with technology, there should be new opportunities for expression, not limited by traditional structures of gender, technological design, or dance. Margaret Jean Westby is an interdisciplinary artist, researcher, and educator currently pursuing her PhD at the Centre for Interdisciplinary Studies in Society and Culture at Concordia University in Montreal, Canada. She has created and collaborated in dance performances, installations, and films throughout the United States, Canada, United Kingdom, and Europe. Her artistic practice includes the hybridization of human and machine-based actions through a feminist perspective. Her doctoral research encompasses both a practical and theoretical approach into exploring strategies to remap gender behaviors, engagement, and inequity in the area of technologically augmented dance performance.